Hi all, it’s Kathy here again , and it’s my turn to show you what I have been up to this month. 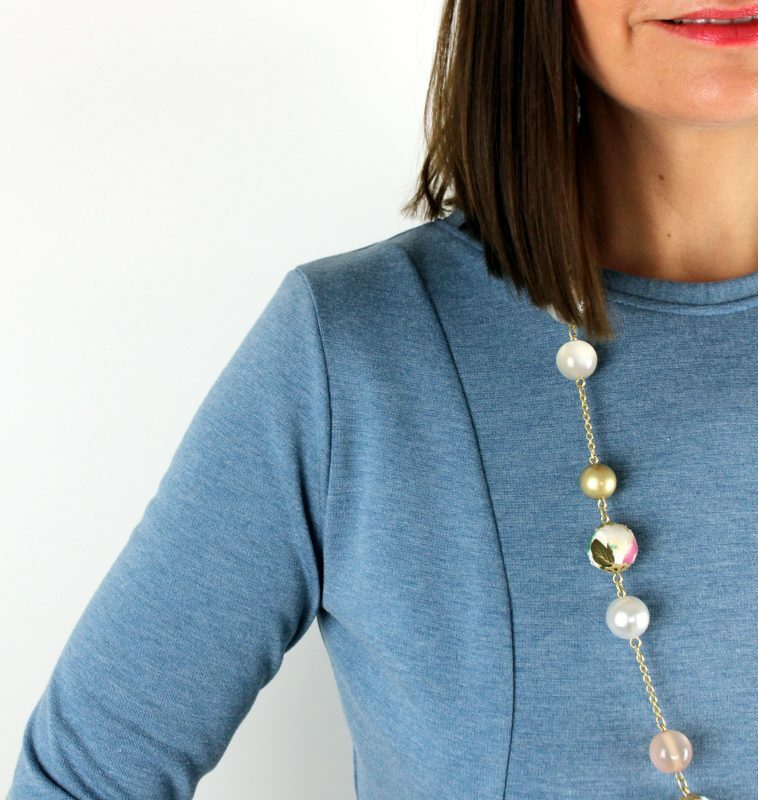 When it comes to fabric choice, I am normally drawn towards a printed design, but for this make I have been inspired by a couple of my fellow Sewisfaction bloggers and have gone for a solid colour. How classic is this Marl Blue fabric? It’s buttery soft and super comfortable to wear. 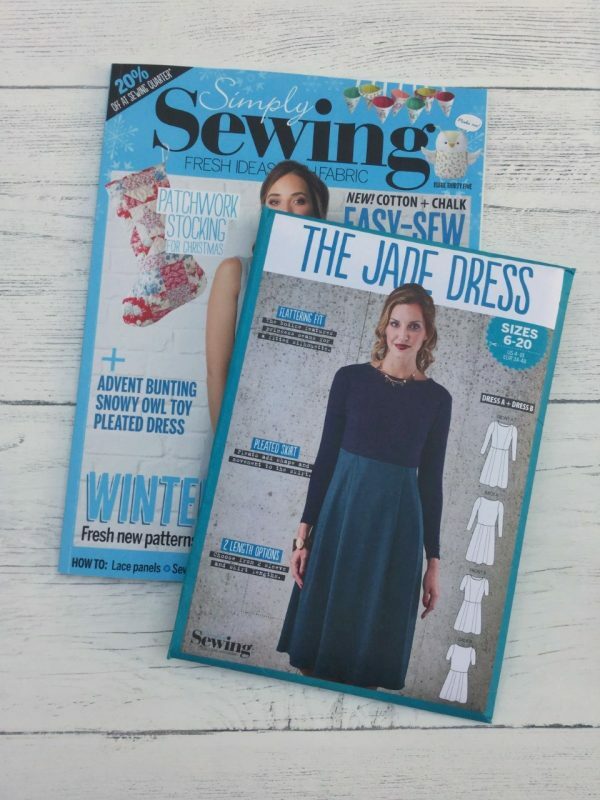 My pattern choice is The Jade dress, which was the free pattern in Simply Sewing magazine last month (issue 35). 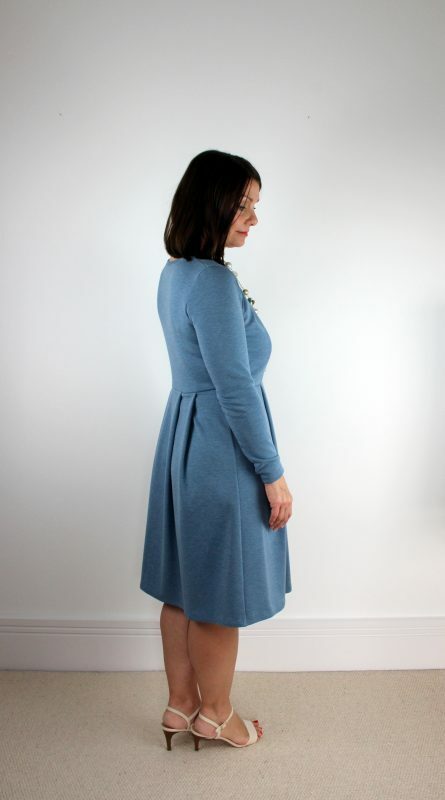 As you can see it is a simple knit dress with princess seam detailing, a pleated skirt (front and back), and two sleeve and skirt lengths to choose from. 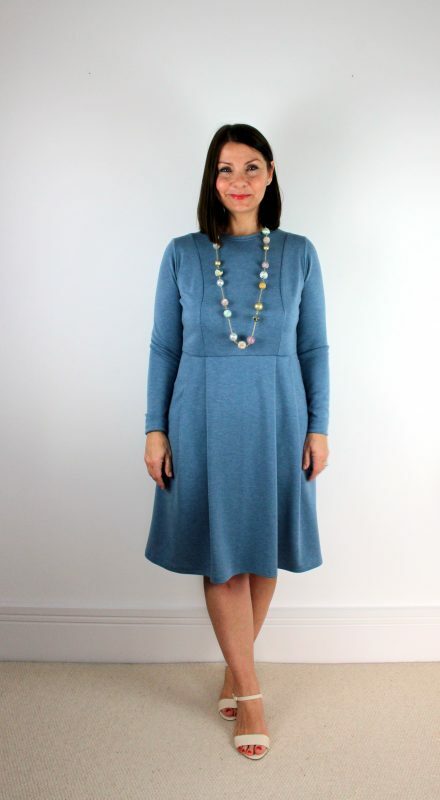 I chose to make View B which has the shorter length skirt, but I chose to add the long sleeves from View A as I thought it might be lovely to wear on its own without the need for a cardigan. The quality of this fabric is second to none. No fraying, no curling, it has been a pleasure to sew with and it is so warm to wear. I’m really happy that I went for long sleeves, as I do feel the cold and this will keep me nice and cosy. The dress was enjoyable to make as very good written instructions are accompanied by beautiful step-by-step photographs. It is straightforward to sew – the only part that you have to work out for yourself is the length of the neck binding. The instructions ask you to measure the neckline and cut your neck binding 10% shorter. Initially I wondered if this would still be too long, but then remembered that the neck binding was cut along the grain (not on the bias), so wouldn’t have as much stretch as I was normally used to when applying neck bands. It went together nicely after all, and was the perfect length. Phew! Another feature which is quite neat is that when you attach the bodice to the skirt piece, you sew in a line of clear elastic. This is quite fiddly, but is clever in that it doesn’t gather the waist but allows a little stretch so that you can easily pop the dress on and off without the need for a zip. I will confess that my pleats perhaps don’t line up with my princess seams as much as I would have loved on this occasion, but what with pinning and elastic insertion at the same time there was a little bit of slipping, despite using my walking foot, but hey ho! you can’t win them all and I can live with it! If you didn’t grab this pattern when the magazine was current, all is not lost. I feel that it is very similar to the Pauline Alice Aldaia dress – in fact the Aldaia dress has even more variations! Sewisfaction has a super range of Ponte fabrics which are perfect for the Jade dress and the Aldaia, you could keep it simple and opt for a solid colour or go for a print – how cute could that be! I also think this fabric would be a superb choice for the Nina Lee Southbank Sweater and also a Sew House Seven Toaster Sweater, both of which I have on my sewing wish list. Thank you to Sheona for the generous supplies that she has provided for this make, I know it will keep me warm and snuggly throughout the Festive period and well into the New Year. I’ve recently started sewing again and seem to have a problem with the sizing of patterns. I also have this pattern and was wondering what size to make. Is it generous or skimpy.